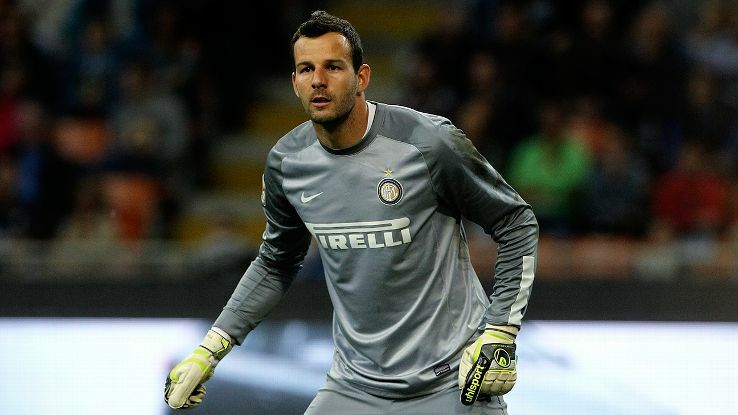 Manchester United could reportedly turn their attentions to landing Slovenia international goalkeeper Samir Handanovic, according to the Express. The Red Devils, who lost 2-1 at Tottenham Hotspur on Sunday afternoon in the top-flight, have been linked with signing the Inter Milan shot stopper this summer, as a potential replacement for David De Gea. The 32-year-old, who 81 international caps for his country, has kept 10 clean sheets in 42 appearances in all competitions for the Serie A outfit so far this season. Handanovic, who has previously played for fellow Italian clubs Lazio (loan) and Udinese, is on United manager Jose Mourinho’s alternative wishlist, should the club fail to land first choice Jan Oblak from Atletico Madrid. Red Devils star De Gea is tipped to join La Liga giants Real Madrid ahead of the 2017-18 campaign, whilst Slovenian Handanovic is ready to leave the San Siro, despite Inter’s Chinese owners preparing to spend a large amount of money during the forthcoming summer transfer window.